Nick Rhodes, 45, formed legendary pop/rock outfit Duran Duran with fellow Birmingham, England, native, bassist John Taylor in 1978. After recruiting singer Simon Le Bon, guitarist Andy Taylor and drummer Roger Taylor, the band enjoyed worldwide success following the release of their second LP, Rio in 1982. Since then, Duran Duran has sold more than 70 million albums, earned countless accolades and influenced a new generation of rockers. With the November release of their 13th studio album, Red Carpet Massacre, the four-piece band (guitarist Andy Taylor left in 2006) is touring the world again—with wine, of course. In the nearly three decades that Duran Duran has played cities large and small, wine has always been along for the journey, either at a restaurant after the show or, more recently, pulled from the band's traveling wine cellar. Wine Spectator: How did you develop an interest in wine? 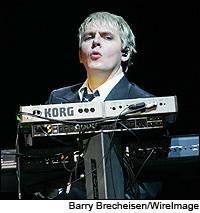 Nick Rhodes: When I was a teenager I started to drink wine with meals, as is fairly commonplace in Europe. Just very simple wines, both white and red. I found the whole routine of sitting down for a meal and having a few glasses of wine to be a very favorable combination. When [Duran Duran] started to travel more, I really began to develop a taste for different varietals of wine. I was particularly keen, when we were outside of France and Italy, to see what wines were like in different countries. At that time, the export trade in New World wines was nowhere near what it is now. It was quite interesting to go to South America and drink the local wines and go to Australia and see what they had there. Now, we are all so spoiled for choice. WS: What are your favorite wines? NR: I'm one of these people who can jump from one thing to another because I like different things for different moods. I suppose my favorite wines are the super Tuscans, which I discovered some 15 years ago, particularly Sassicaia, Ornellaia and [those from] Antinori. I like the whole Chianti region. I think a really good, simple Chianti Classico is usually a safe bet if you're traveling. I also like a lot of Bordeaux. NR: Well, [Château] Lynch-Bages is another of my personal favorites. You can't go wrong with a bottle of that. And a good old bottle of Margaux never did any harm either. NR: I follow the road maps from the experts. I don't feel that I have such a fine nose for wine that I can taste the differences from the great years. Certainly, now, there's so much information available. 1989 and '90 I think are particularly good for some of those wines. '85 was an extraordinary year. When I first started looking at it, someone told me, "1959, now that's a really good year for Bordeaux!" I thought, that's so old, never mind how much it's going to cost. [But] that's one thing I am always amazed at with wine, with great collectors who have these wonderful cellars. [But] I don't tend to buy many bottles of wine that are more than a couple of decades old. WS: When the band is on tour, do you visit any wine regions? NR: I spent a little time in the Napa Valley. It was far more beautiful than I thought. I was quite enchanted with it. I visited a bunch of the vineyards. It was fun to go to the Coppola vineyard for completely different reasons. If you're a bit of a film buff, a lot of his Oscars are there, and props from the movies. [But] when we're on tour, we don't have the luxury of enough days off to make it deep into regions. What we do do if we have a day off in a good, cosmopolitan city is seek out a great restaurant, usually with a great wine list, and experience it that way. WS: Are the other members of the band into wine? NR: Simon collects a little—he actually does have a cellar. We have similar tastes in wine, [though] he likes Burgundies a little more than I do. Although I have been known to drink a slightly chilled Gevrey-Chambertin at lunch. He has a collection of super Tuscans, some Bordeaux, some Burgundies. I don't have a cellar at home, probably for my own safety and bank balance. I [only] keep 30 to 50 bottles around. WS: Who chooses the wine when you go out to dinner? NR: I do. Simon is perfectly happy for me to choose. But to be honest, I'd be perfectly happy for him to choose. He has wonderful taste in wine. WS: When you are on tour, you travel with a wine cellar. Can you tell me about it? NR: The first time we did it was on our last big world tour. It was getting increasingly difficult when we went to less cosmopolitan cities around the world, it was hard to find good wine, [and] it was becoming a bit of an issue for some of the local promoters. It seemed to make sense for us to travel with the things we like. It was really just sticking another flight case on the back of the truck. We had a flight case specially created to keep all the wine fairly still and secure with foam around them. It stored about 100 bottles, maybe 120. It was a real luxury. When you are away from home a lot, it is nice to have a few of those comforts. A decent bottle of wine in the evening was one of those. Roger tends to go more for the white ones; Simon and I work our way through the reds. WS: Do you celebrate with wine after a show? NR: Yes, especially if I am having food. It is one of life's great pleasures. I'm a vegetarian so there's none of this "steak with a nice heavy red" business for me. Actually, tofu and Gevrey-Chambertin is a very interesting combination. There is something about the collision of flavors there. I try to stick with Italian wines when I'm eating pasta—that's when the super Tuscans come in.